I bought my copy of My Dear Bessie at Daunt Books when I was in London. 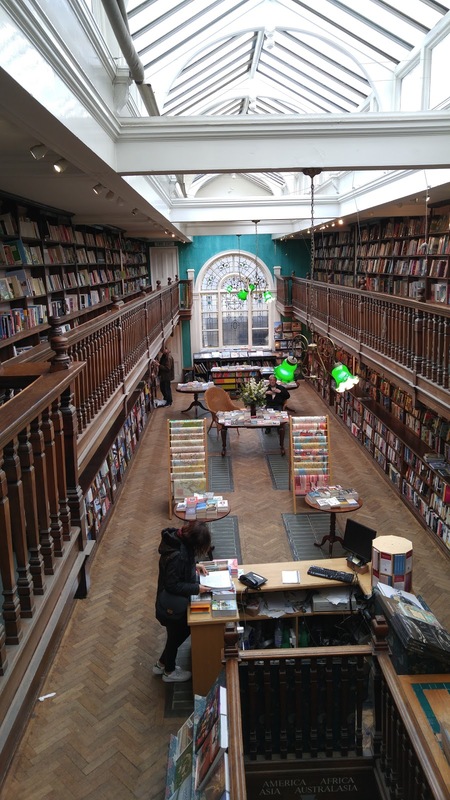 Isn't it the prettiest bookshop? I wish I could go back right now and spend the day browsing and buying too many books. Then I would go find a cafe and sit drinking tea, eating cake, and dipping in and out of all my new books. Doesn't that sound like the most perfect day? 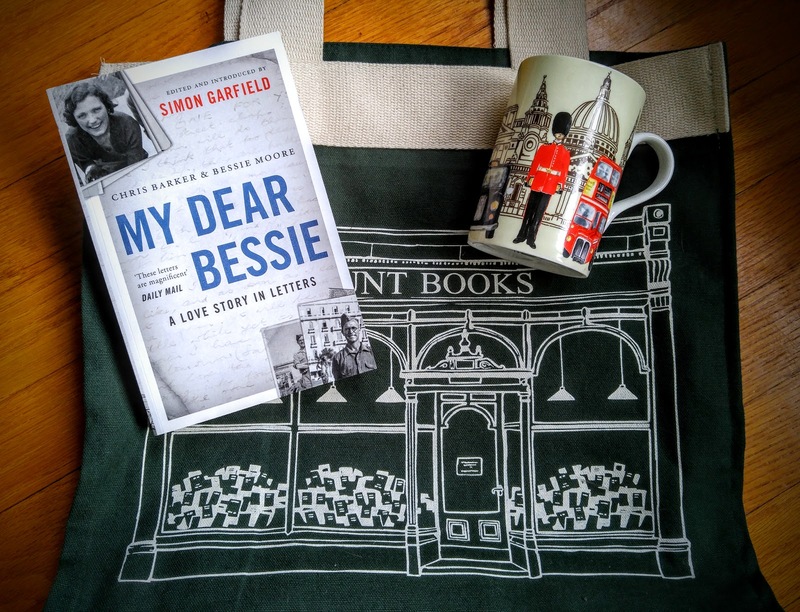 My Dear Bessie--A Love Story in Letters is a compilation of the letters Chris Barker and Bessie Moore wrote to each other during World War II. It is edited by Simon Garfield. I originally heard about it because excerpts were read from it during Letters Live with Benedict Cumberbatch playing Chris Barker and Louise Brealey playing Bessie Moore. I am sure you can still find the clips on Youtube. They are no longer available to play on the BBC. Reading letters and diaries always feels a bit voyeuristic. You are reading something that was not originally meant for your eyes. However, Chris and Bessie's children donated their letters to the Mass Observation Organization so I gave in to my inner nosiness and enjoyed seeing their relationship and personalities develop. Chris and Bessie were acquainted before he went overseas during the war but they were not involved in a relationship. He was filling his days by writing letters and one day he wrote to Bessie. That was the beginning of a love affair that progressed rapidly. The book is mainly composed of letters from Chris. Many of Bessie's letters got destroyed since Chris had only limited amounts of baggage space. Several times he expressed the sorrow he felt at having to destroy some of her letters. I was amazed at just how prolific their letter writing was. Of course, they did not have the means of communication we do but still they must have devoted huge amounts of their spare time to letter writing. The book comprises only a small selection of the letters that survive. On the 18th of July 1945 Chris mentions just how many letters he has written recently. I have written 298 letters in all since April 10th; 98 to you, 59 to Mum, 141 to others. 98, the number of this, was the last you got from me last year, I believe. So we are well up on the numbers this year, though the sooner we can talk to each other rather than write, the better for us both. Oh, my darling Bessie. Chris and Bessie's relationship progressed very quickly. They went from being simply friends to discussing marriage within a few months. It was enthralling and touching to see how much they came to care about each other with only the letters to tie them together. When Chris finally got leave they were able to spend some time together. They found it awkward and a bit difficult but it just brought them closer. The letters frequently made me chuckle. Chris could quickly go from talking to Bessie about how much he desired her to how he felt about the socks she was knitting him. The letters are very much a conversation between two people with all the fits and starts and digressions an actual verbal conversation would have. Both of them had a way with words and their emotions and personalities come through loud and clear. If I say or write a thousand times before we meet again, 'I love you,' I want it always to come to you as a fresh, vigorous affirmation of faith, of deep feeling of my need of you, my desire for you. We are so much strengthened now by our meeting: I have seen you, your eyes when you looked at me-and I hope you've seen, and will remember, my eyes. I think I shall have to write to you rather differently from my 1944 items. I am now too much aware of you, too moved within me by the knowledge of you and the fact that now we are one. We now do know what we mean to each other. I think correspondence is going to be more difficult in the light of this and I know (it is wonderful to be so sure) you will forgive me for my faults where they occur. Letter writing is a bit of a lost art these days and I think the world has lost something as a result. We are all about quick communication and short messages. These definitely are convenient and do remove some of the stresses of everyday life; Bessie would no longer have to worry for days and weeks at a time about the safety of Chris during war. However, I am a bit enthralled with the thought and care that went into the letters. The idea of sitting down, putting pen to paper, and really communicating is enticing. The idea of a love affair that grew from friendship solely by the means of letters is charming. The book finishes with afterwards by the Barker's son and granddaughter. The letters end when Chris returns home but we want to know more. Were they happy? What happened next? The afterwards round out the story and leave the reader with a sense of a satisfying conclusion. Read My Dear Bessie. It is a love story in letters and I defy you to read it without falling a bit in love with the writers and a bit in love with the art of letter writing. Ohh I really want to read this now. I love WWII books and this story sounds so beautiful. This is not the same at all, but when my husband is deployed on the submarine, our only communication is sporadic emails. Getting an email from him means so much to me and I love writing to him! I enjoy WWII books as well. I think you would like this since you would relate to their situation to a certain extent. Having to wait for emails from your husband is similar to waiting for a letter to come in the mail. That must be hard for you sometimes. Yes, it can be really hard, especially when you go a month or so without an email. But they are so special to me! I can't wait to read this book. I love books of letters, and this does sound delightful. I'm still envious of your trip, and all the wonderful bookstore browsing you got to do. It is nice to hear from you again. I hope your move went well. I enjoy books of letters too. They are just so real. I feel the same about published diaries. You see the inner workings of people's minds. That is how I felt. They had to sit down and really think about each other while they were writing. Letter writing is definitely a lost art today although there are plenty of poeple my age (60+) who remember having penapls when they were in their teens, and want the same now. I think life has gotten busier, but I also think that if we took the time we spend on the Internet every day, we could write letters regularly. That we don't is a loss to our society. Of course, I'm going to add My Dear Bessie to my TBR list. Thanks for letting me know about it. It is a loss. We get sucked into doing other things and thus we miss an important method of communication. My husband and I got married almost twenty-six years ago and we lived hours and hours apart while we were dating. We wrote a lot of letters because phone calls were expensive and email was nonexistent. The more letters we wrote the easier it became to put our thoughts down on paper. I hope you enjoy My Dear Bessie. Adding this to my to-read list! I think you will enjoy it. Let me know what you think once you have read it.